Traditionally, men arrive for a first date with flowers. Don Spoon brought Ginny just the pollen! And so at their first dinner date in 1993, Ginny made her first iris cross, 'Zurich' X 'Chaste White', using pollen from Don's garden. 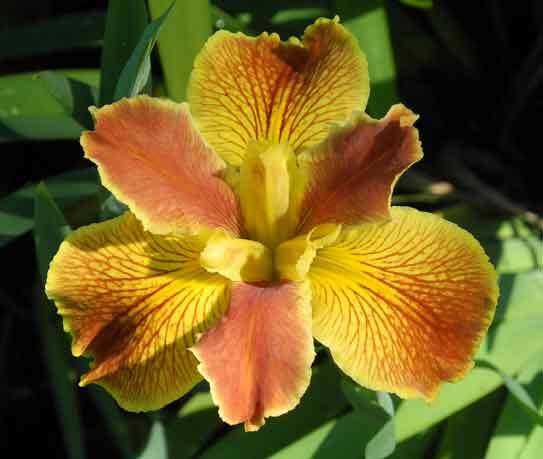 The match produced offspring: Ginny's first iris introduction, 'Autumn Ivory'. Does it get any more romantic than that? Don and Ginny Spoon are the owners of Winterberry Gardens in Cross Junction, Virginia. Their gardens are in USDA zone 6, 1100 feet above sea level. The main problem in their climate is the extreme temperature shifts. Spring temperatures might go from the mid 80's in the daytime to 25 at night! Those of you gardening under these conditions know that this can pose challenges for growing irises, because they may begin to bloom and still be vulnerable to frost. 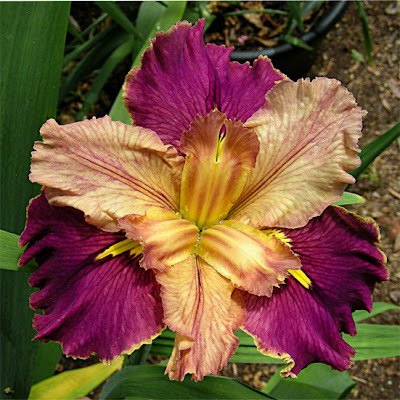 Don started hybridizing as a youngster, over 60 years ago, along with his mother, Lilla Spoon, who was president of the Charlotte, North Carolina Iris Society at the time. Don majored in biology, earning his Ph.D. and taught at Georgetown University in Washington, D.C. for over 22 years. He established a lovely garden there, which is still maintained by the staff at Georgetown. Don also discovered a previously unknown organism and published a scientific paper and got to name it [Euhyperamoeba biospherica]. Ginny earned a degree in horticulture, and she says "so of course, the biologist and the horticulturalist are always arguing over who is right about what to do in the garden, but we manage to do it without too much bloodshed." Don and Ginny worked at the Biosphere 2 in Arizona when they were first married. He helped design the ocean and was in charge of it for two years. Ginny went along for the ride, but ended up taking care of the Intensive Agricultural Biome for three months so the manager could visit his family in Nepal. They planted quite a few irises around the Biosphere 2, where they still grow today. One of Ginny's favorite introductions is Don's 'Little John'. Ginny says "Don took me out to a large planting of his seedlings in Maryland where I first saw 'Little John' in bloom. Of course it was just a seedling then. I wanted it but we had no tools and the ground was dry and hard as cement. Don was ready to leave but I had to have a piece so I took a rock and managed to chip out a rhizome. I planted it and the next year it was in bloom with 11 buds. Don got his shovel right away and we traveled the three hours to dig out the rest of it. 'Little John' was not named for the character in Robin Hood as many people have thought, but for a young man who helped me in my garden who was a John Junior, but his dad called him "Little John." 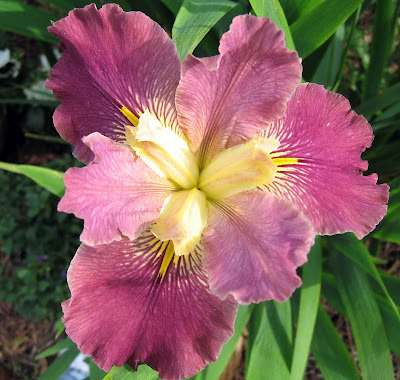 Sadly, he died very young from leukemia, and I asked Don if I could name my favorite iris for him. 'Little John' is a cross of 'Damsel' by 'Queen Dorothy' and since it is half rebloomer it also has produced rebloomers for us, including broken colors. I have seen it growing very well in Colorado, Oklahoma, Texas and Maryland. I think the best planting was at the garden of Owens Rebert." When a dreamy orchid-colored seedling bloomed, Don kept asking Ginny if she could see the dove-blue color in the crests. Hence the name 'Orchid Dove'. It has been reported to grow well wherever they have sent it. At the National Convention in Wisconsin it got the most popular votes for a tall bearded iris out of region. Don was waiting to name an iris after his love, and when the first flower on this seedling opened, his exclamation of joy and surprise was "My Ginny!" Both Don and Ginny love the 'Emma Cook' color pattern. 'My Ginny' won the popular vote at the International Competition in Florence, Italy for a commercial variety and the Franklin Cook Cup at the 2003 National AIS Convention. 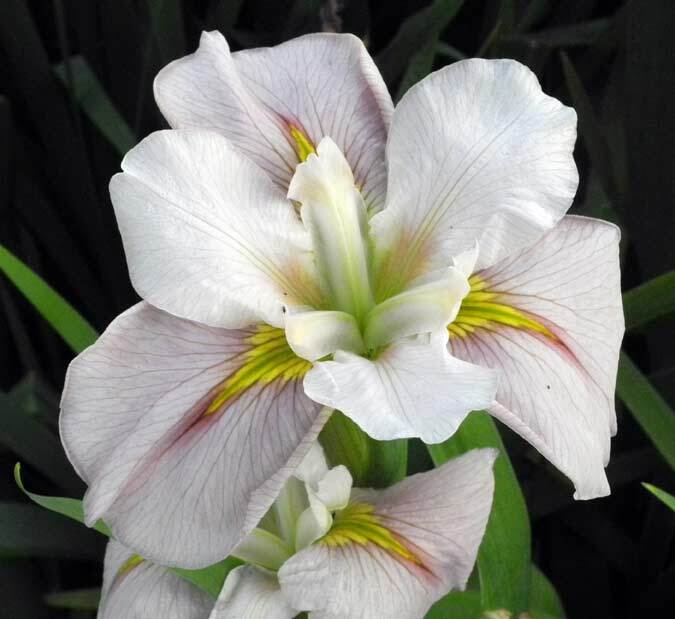 It grows well all over the U.S.
'Daughter of Stars' is another of Don's irises beloved by Ginny. They named it after the local Native American legend about the Shenandoah River, which says the river is so deep and dark that it gave birth to the stars. This iris won the Wister Medal 2007. It grows well all over the country and reblooms in zones 6 through 9. That takes care of Ginny's favorites hybridized by Don, but what of her own efforts? Of her own introductions, a great favorite is 'Selah Christine', which is named after Ginny's granddaughter. 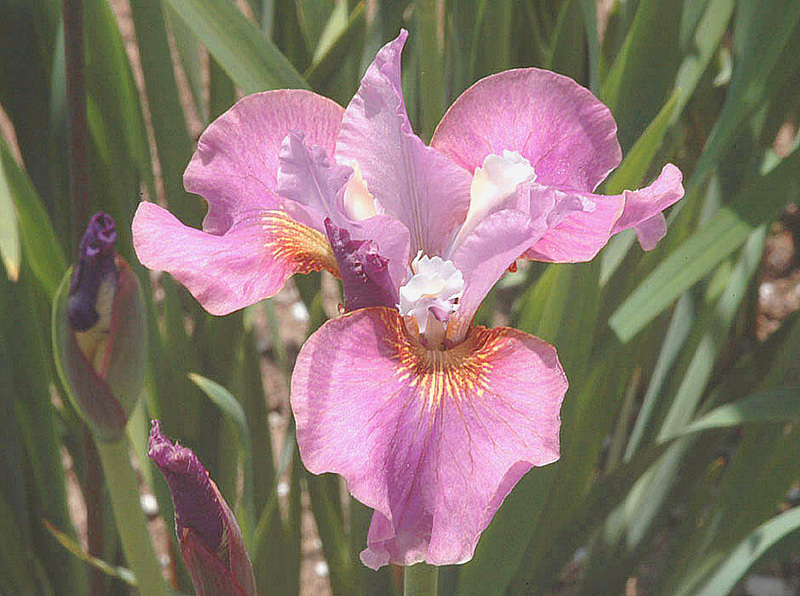 It has been awarded an Exhibition Certificate (EC) which is the only award an iris can get that is not a garden award, and a High Commendation (HC) for a seedling iris. She has high hopes that it will also do well in most areas. 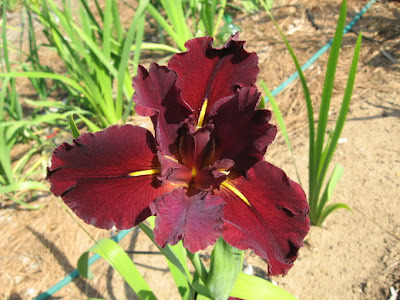 Another is 'Zippo', a nearly black SDB (Standard Dwarf Bearded) iris with large pure white beards, is named for Ginny's daughter-in-law's cat, which is black with white paws. A wide, velvety red iris with showy orange beards inspired the name 'Velvet Elvis'. This SDB won an EC as a seedling. The striking 'Autumn Rose' reblooms in the autumn. Ginny crossed Don's beautiful pink rebloomer 'Diamond Blush' and Ghio's dark pink plicata, 'Chatter' (which rebloomed once for them) and got a nice zone 6 rebloomer. Don had told Ginny that if you cross a solid color with a plicata it would intensify the color, and indeed it did. It is a very intense rose pink that stands out in the garden. 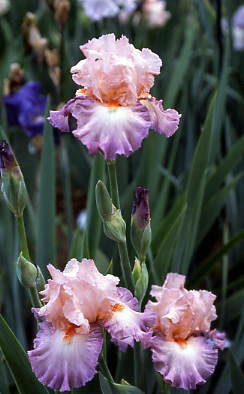 When Don and Ginny met at the C&P Iris Society, they each had a large collection of rebloomers. 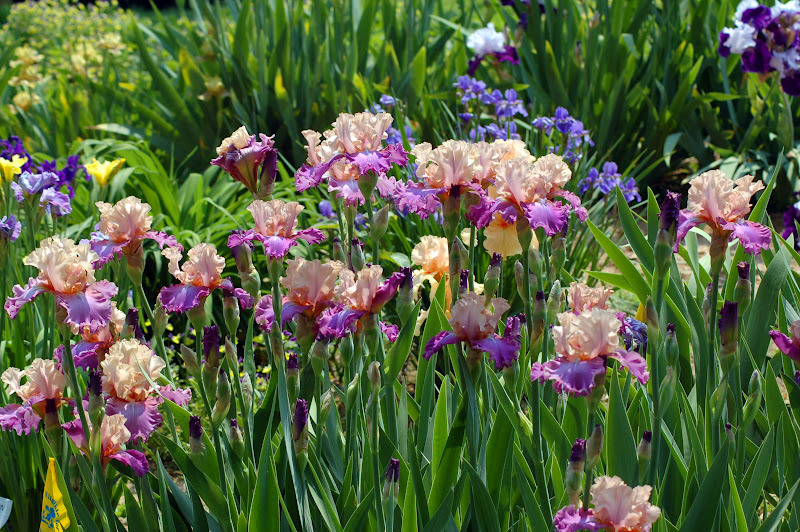 They continue working to produce irises that are multiple rebloomers with modern form, vigor, and exceptional coloration. I grow two of their irises in Southern California. 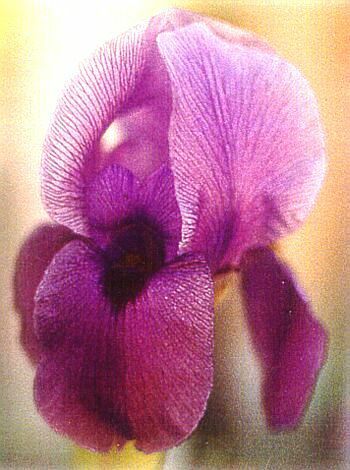 MY favorite is 'Plum Pretty Whiskers' which has that gorgeous orchid color of many of their irises. It is not listed as a rebloomer, but it reblooms in my garden. I also recently planted what may be their most famous iris, 'Daughter of Stars', even though I had to create a place in my garden for it. I couldn't help myself! Do you grow any Spoon irises? Do they bloom in your zone? And are there any irises that you would love to see in a reblooming version? Let us know here in the comments section. I admit I wondered if I could think of anything new to post. Having the worst cold I've had in years has not helped. I was digging through my photos looking for inspiration when I came across some old pictures of Iris suffering a virus of their own. As you can see, a virus can be quite beautiful when a flower catches one. This was an icy blue Iris cristata. Every fan in the clump was affected at the same time. The dark blue stripes made for an astounding looking flower but the plant was very weak and did not survive the summer. 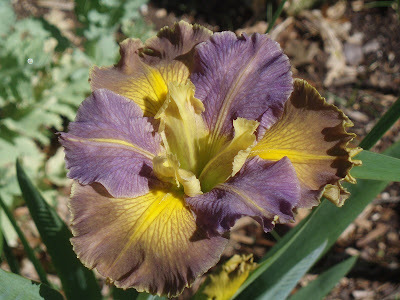 Another Iris that came down with a virus that manifested on the leaves and bracts only. The flowers were unaffected. This was a typical Iris magnifica until it became ill.
As you can see the bright yellow foliage with green stripes was quite showy. I was excited when I first saw this as I thought it was a variegated sport. Alas, it barely managed to open its last flower before collapsing never to be seen again. Iris with broken colored flowers and variegation do not have a virus. 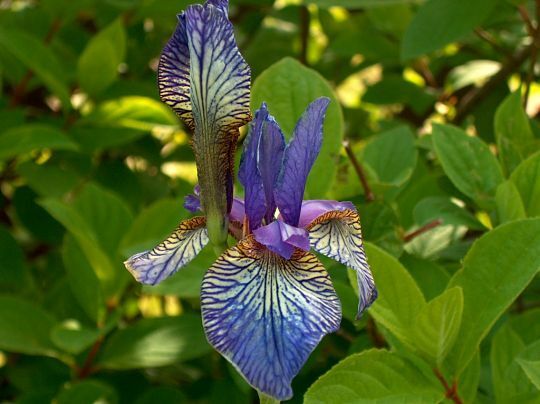 You can grow these with no worries of infecting the other iris in your garden. I often hear someone state that all variegated plants have a virus and this is patently untrue. There are, of course, always exceptions. Iris latifolia, the 'English Iris' nearly always displays the results of a minor viral infection. Even when grown from seed it will eventually develop a stippling of color on the flower that resembles a broken color Iris. This seems to do no harm to the plant however and there is nothing to suggest it can pass the virus on to other Iris. Now, if you'll excuse me, I have to go blow my nose! So many blues, so little space! 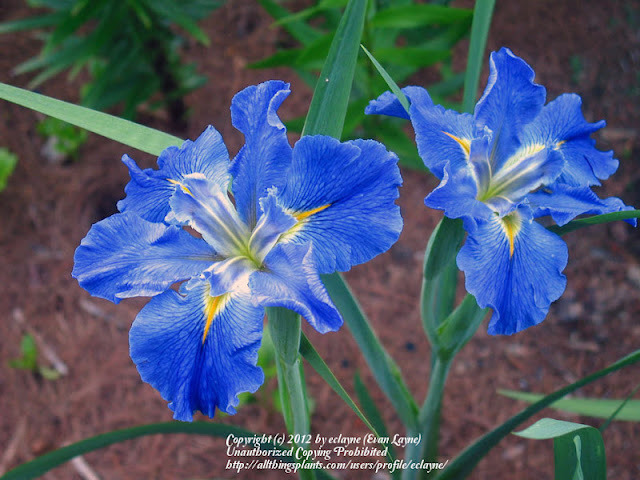 In the last post on blue irises, people shared their favorite blue tall bearded irises. 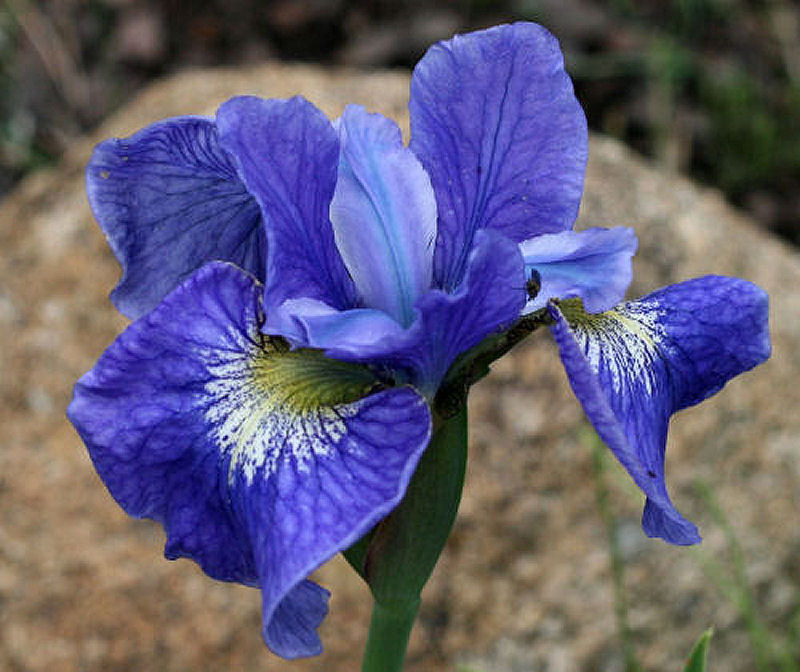 But bearded irises are not necessarily the bluest of the blues; indeed, Siberian irises, Japanese irises, and Louisiana irises come in blues to melt your heart. 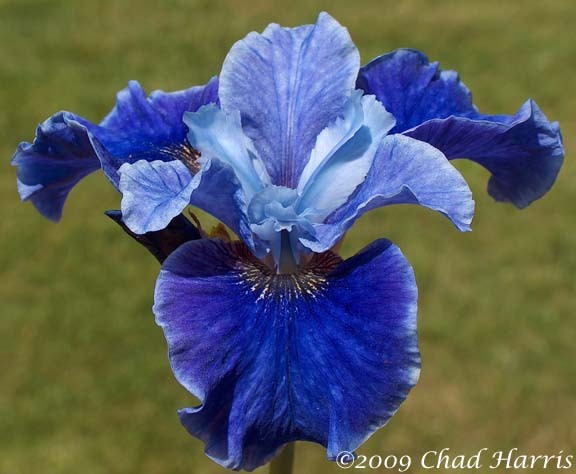 So here are the truest blues, the prettiest blues, and the best performing blues in these categories from my random poll of iris growers and gardeners across the Internet. Let us start with Japanese irises, also known as ensatas. The top vote-getter for favorite blue was 'Lake Effect'. Take a look at that sky blue color! 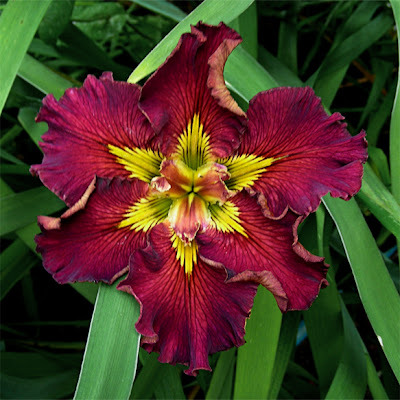 Chad Harris, an iris hybridizer, flower photographer extraordinaire, and owner of Mt. 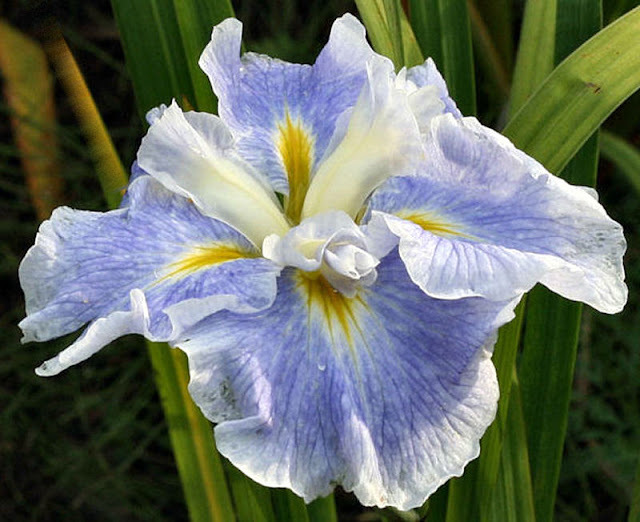 Pleasant Iris Farm in Washington, claims 'Banjo Blues' as his top pick, but he couldn't help throwing in a lovely pale blue, 'Bewitching Twilight'. Marilyn Campbell, who lives in Massachusetts, loves 'Sing the Blues'. Her photo tells you why. 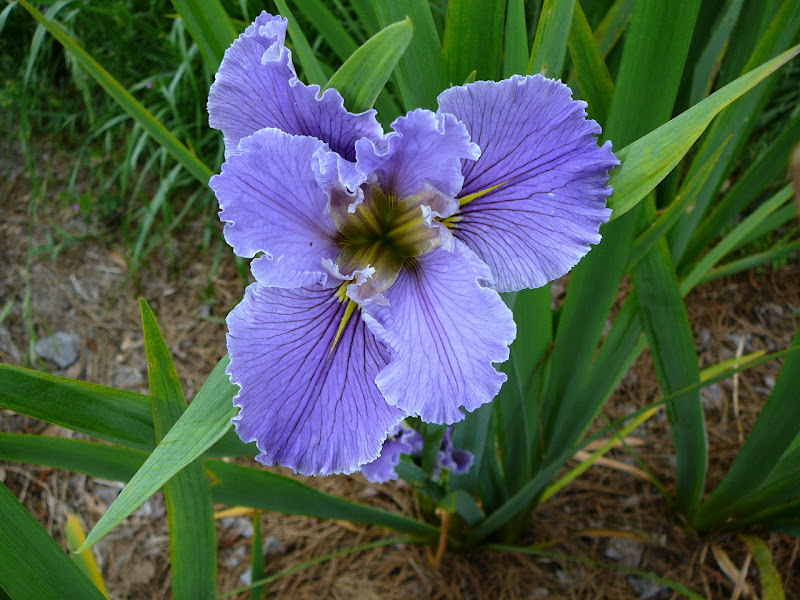 Unlike the bearded irises, Japanese irises require moist soil to thrive, as do Louisiana irises, natives to the bayous of the state. 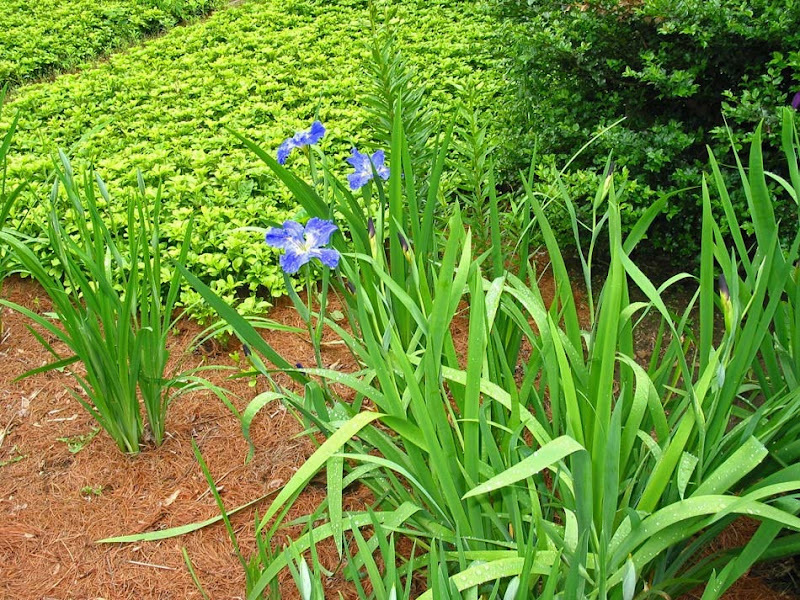 Like Japanese irises, Louisianas can be grown in boggy conditions. Louisianas come in a wide range of colors, including some stunning blues. A recent poll at a San Fernando Valley Iris Society meeting found the blue Louisiana iris 'Sinfonietta' a popular choice, and here's why: take a look at Evan Layne's beautiful photos, close-up and in the garden. 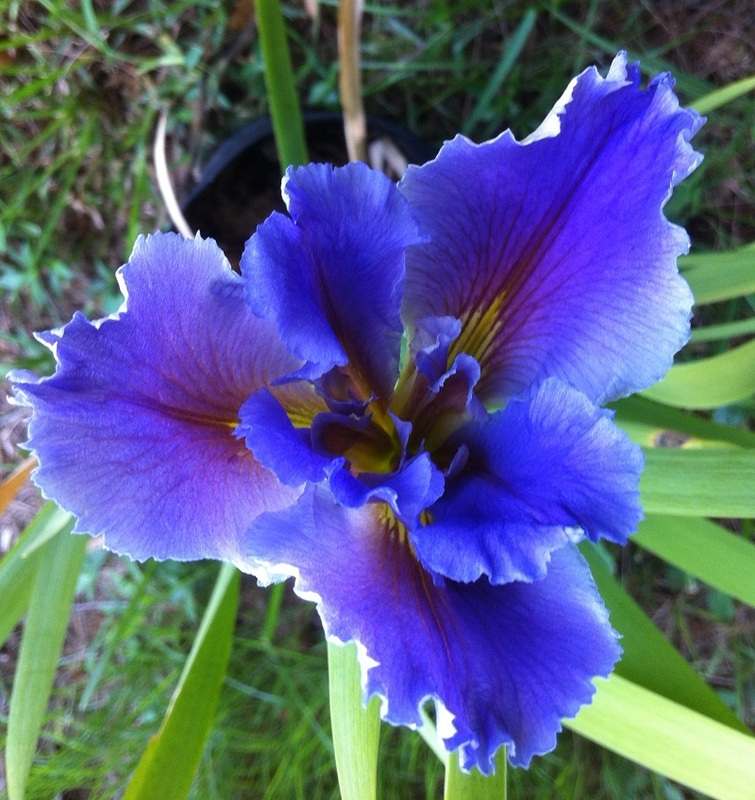 Another gorgeous Louisiana blue is recommended by Patrick O'Connor of Zydeco Louisiana Iris Garden. He says 'Lake Sylvia' "may be the most brilliant, saturated blue available." Ron Killingsworth, one of the contributors to this blog, lives and gardens in Louisiana. He has seen just about every Louisiana iris, and his very favorite blue is 'Southdowns' by Patrick O'Connor. He says it is a very soft blue. Ron also likes 'Little Rock Skies' which is a very pretty blue with short foliage and petite blooms. Another favorite blue is 'Dural Bluebird' which has some very nice ruffling. 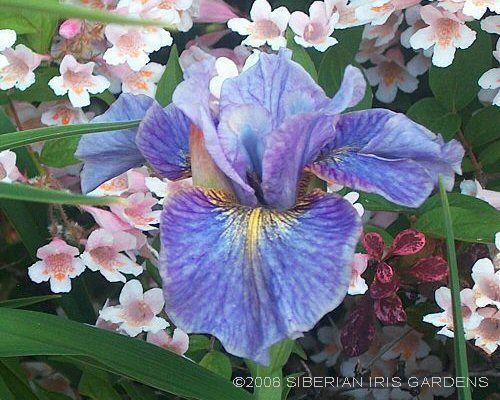 Siberian irises have lovely graceful foliage and come in a great variety of blues. Polly Kinsman, an avid iris gardener and a grower who owns Siberian Iris Gardens, says 'Careless Sally' is her very favorite. She also likes 'Shaker's Prayer'. 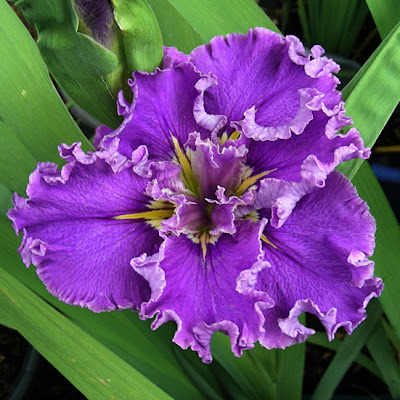 Polly and Denise Stewart, owner of Snowpeak Iris in Oregon, are administrators of an internet gardening community called Iris Cubits, where many lovely photos of Siberian irises can be found. Marilyn Campbell claims 'Lee's Blue' as her favorite blue Siberian iris. A popular blue that is in widespread commercial circulation was shared by Sandra Eggertson. 'Silver Edge' grows well in her garden in Manitoba, Canada. 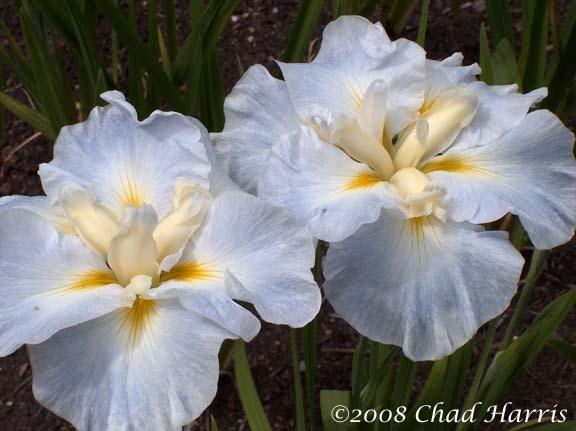 Chad Harris grows and sells Siberian irises as well as Japanese. 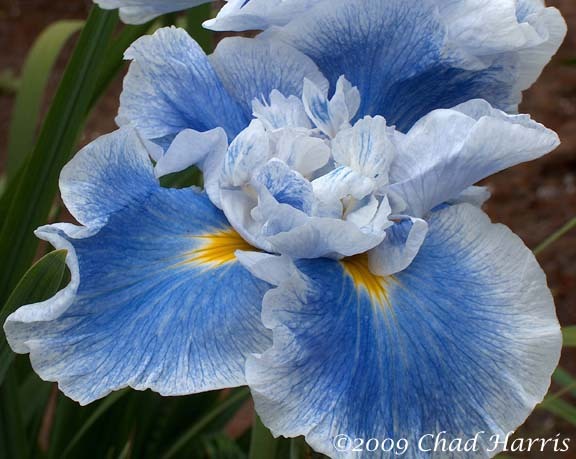 This striking blue iris is his favorite blue Siberian. Kathleen Devlin, who gardens in Michigan, sent this photo of 'Cape Cod Boys', her favorite. This clump growing in John and Jean Kaufmann's garden will be even more spectacular by next year's Siberian and Species Iris Convention in June. Which of these beauties is your favorite? 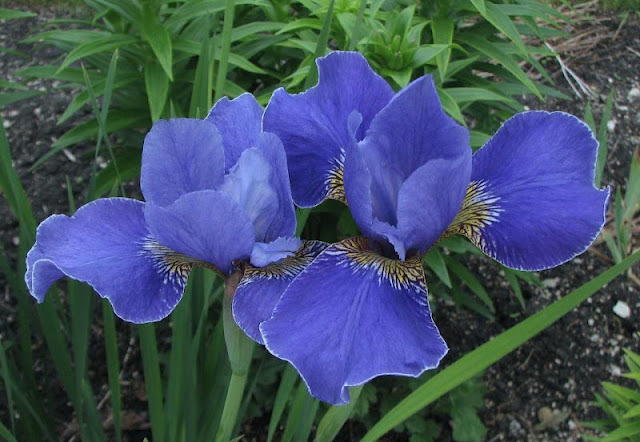 Do you grow any blue beardless irises, and if so, which do you think is your truest blue? 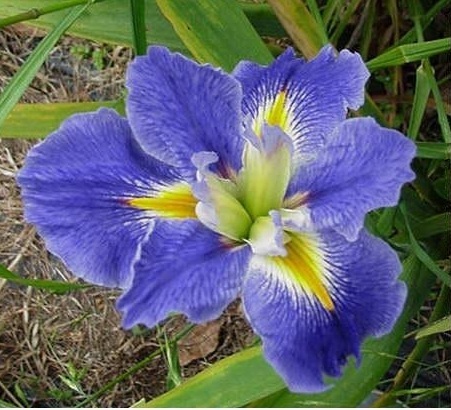 When you take pollen from one iris and put it on another iris, you are said to be "hybridizing" an iris or "crossing" an iris. The pollen is taken from the "pollen parent" and the pollen is placed on the "pod parent". You might consider the pollen parent the father and the pod parent the mother. The pod parent is the bloom that is going to be pollinated and will produce the seed pod containing the seeds of the new "cross". There are a lot of people out there dabbing pollen on irises! Each cross will produce seeds, if you are lucky, and the seeds, when germinated, will produce "seedlings". 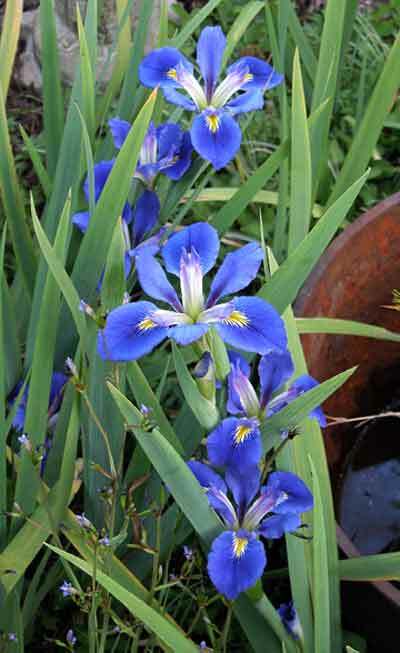 Seedlings are new irises produced by your hybridizing efforts. The Louisiana (LA) iris seed pods are harvested in about July or August in Louisiana and the seeds are potted up and marked with the identifying data of the cross. With luck the seeds will germinate in the fall and continue to grow through the first bloom season and on through another year, finally blooming in the second year. So it takes a couple of years to find out what your cross produced. 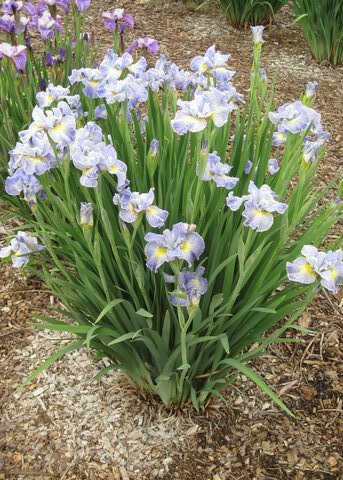 The new irises called seedlings are identified by a seedling number until such time as the hybridizer decides the iris is worthy of registration and eventual introduction. 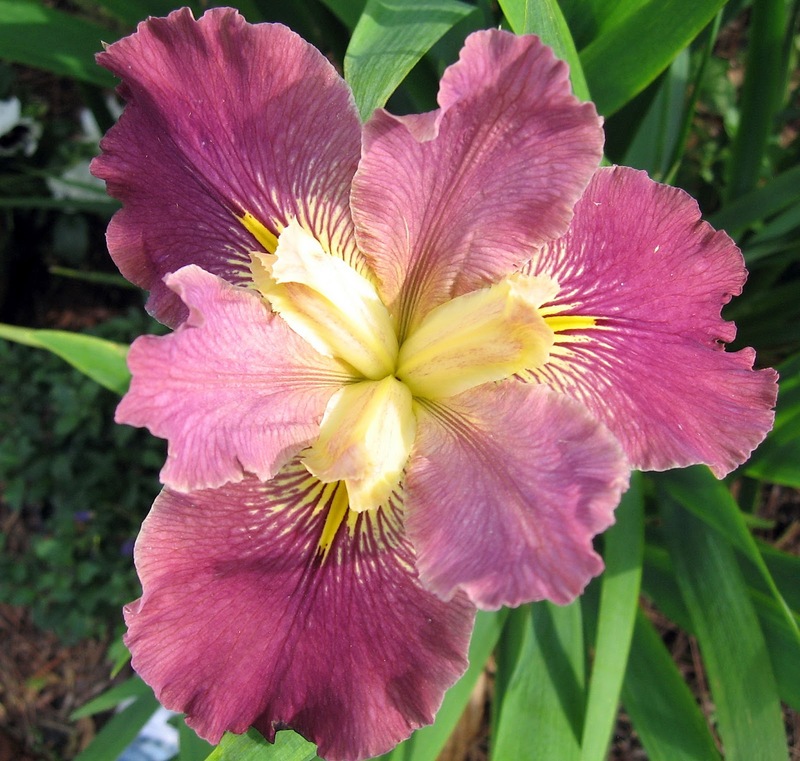 Registration is accomplished through the American Iris Society. A seedling continues to be classified as a seedling, even after it is named and registered, until it is introduced by offering it for sale and publicizing its availability through a commercial grower, or through your own garden. And here are some seedling pictures from the 2012 bloom season. 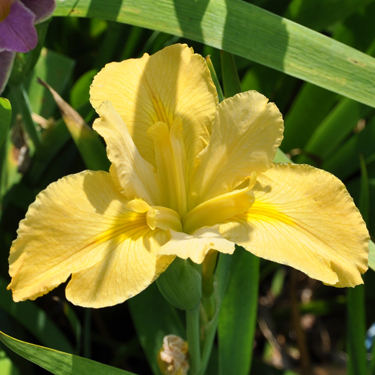 As you can see, Louisiana irises come in just about every color under the sun. 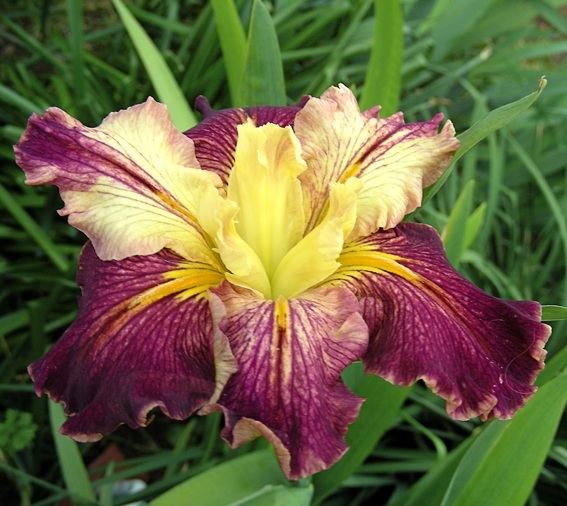 Now that you are all excited about making some new irises, take at look at the web site of the Society for Louisiana Irises and learn more about hybridizing irises. Give it a try. You might just produce the next "Dykes" award winner! For the last several weeks, I’ve been engaged in one of the most challenging -- if not the most challenging -- aspects of hybridizing, which is finding names for the new introductions. I hasten to acknowledge that this may be a more difficult task for some than for others. I have a friend, for instance, who readily offers such suggestions as “Hubcap” or “Fence Post”. I’ve stopped asking him for help. The fact of the matter is that if I had to place a bet, every time, that the name I first choose for a new introduction won’t already have been taken, I’d not only be broke, but deeply in debt. I have learned the hard way (i.e., by being gently informed by the Registrar that the chosen name appears in the 1939 or 1949 Checklist, which I had forgotten to consult) that if one thinks of a name from the classics of literature or music, it’s almost certain to have been taken already more than half a century ago. Our predecessors were really enamoured of the classics. Most recently, I encountered this fact when, stumbling across the name of one of the knights of King Arthur’s round table, I wondered how many of those knights may have graced our gardens over the years. Setting out on my quest, I scoured the Checklists and found almost the entire court of Camelot! Now, actually, there were, in the annals, so many knights of the round table that, had they all shown up for a big feed at the same time, they’d have had to eat in shifts -- unless Merlin might have been called upon to do something about the size of the table. But withal the abundance of knights, only about a dozen figured prominently in the Arthurian tales, and two-thirds of them are found in the Checklists. First, of course, is Arthur himself, as ‘King Arthur’ (Kirk, N., R. 1931). Then 'Gawain' (Burtner, N., R. 1934). 'Sir Galahad' (Shull, 1924) was one of the earliest to appear. Percivale shows up both as 'Sir Perceval' (Wing, 1937) and in his Wagnerian form as 'Parsifal' (Mor. N., R. 1928). Tristan, too, is there in his Germanic form of 'Tristram' (Bliss 1919), as well as his beloved Isolde, first as 'Isolde' (Cap. 1902), then as 'Isolda' (Van T. 1916). The registrars apparently were more forgiving in those days. And 'Sir Launfal' (Kirk 1939) is there, but not his fairy princess, Tryamour. Too bad. Arthur’s sword, 'Excalibur' (Mur. 1925) is there, as is the 'Lady of the Lake' (C.A. Wright, 1948), who gave it to him, under her name 'Viviane' (Cay. 1937) as well, but maybe also as 'Vivian' (Cap. 1902) and 'Vivian II' (Cap. 1901), but surely as 'Fée Viviane' (the fairy Viviane) (Bernard Laporte, R. 2004). And, unlike all the others above, for her we have a photo! Other figures and places of the Arthurian legend are also to be found. Pendragon (Bliss, 1920), the name borne by both Arthur and his father, Uther. Merlin (Sturt. 1918), of course. Morgan Le Fay (Gers. N. R. 1938), the enchantresse, half-sister of Arthur. And Avalon (Sturt. 1918), the mystical isle to which Arthur is borne fatally wounded. But, wouldn’t you know, soaking up the limelight comes Lancelot (Bliss, 1919), Sir Lancelot (Gard. And Flow. 232, July 1937), Sir Launcelot (Sass-J. 1935) and, finally Messire Lancelot (Bernard LaPorte, R. 2004) with a photo! And what would Lancelot be without Guinevere (Barr, 1919), and again Guinevere (Elm Jensen, R. 1986), whom Merlin is said to have brought from Ireland and who wreaked havoc in Camelot. Funny, she doesn’t look Irish. 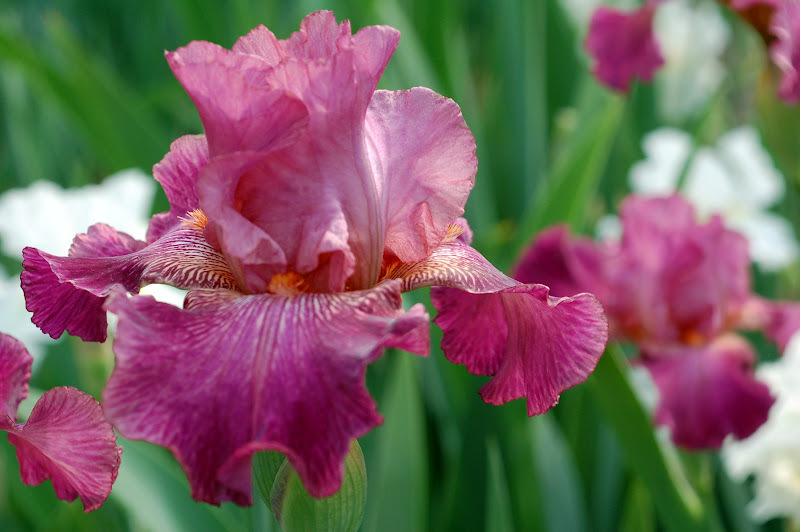 Can you think of any interesting names for new irises? Clear pink is a color we do not much associate with Siberians. There is white, blue, violet, lavender, red-violet, purple and now red/yellow blends, but not really a true pink. Pink is the poor relative as a color. 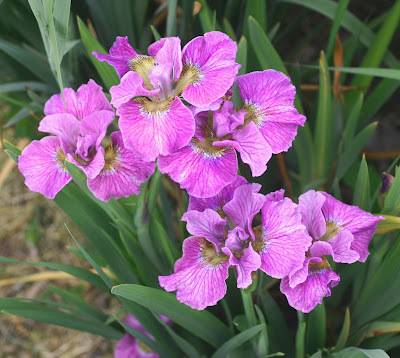 Pink in irises can come from one of two sources, either from carotenoid (yellow, orange and pink) pigments or anthocyanins (blue, red, lavender and violet colors). 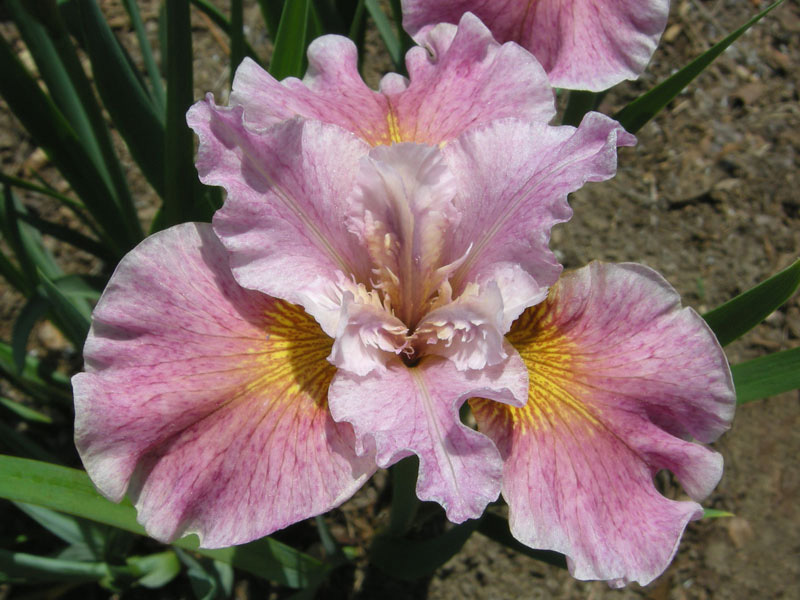 Bearded irises have both types, and so clear pinks are not uncommon – think 'Beverly Sills' for instance. But, so far, there is no evidence for a carotenoid pink in Siberians (or other beardless irises to the best of my limited knowledge). So pink has to come through the anthocyanins, and of course this can give pinkish Siberians, but always with a bluish cast (lavender-pink, orchid-pink) – e.g. 'Pink Haze' (McGarvey, 1980) or 'Mary Louis Michie' (AM Miller, 1995). The fact that there has been little advance in achieving clearer pinks in Siberians in many years suggests that this is not necessarily an easy field to cultivate, but for that reason it is tempting as well as challenging. As with so many other things, working in this area came to my mind as an afterthought a few years ago when a batch of seedlings seemed to give some marginal improvement in “pinkness”. These still tend to the blue side of pink, but truly I think could be termed peppermint pink. One (09F3A3) is under evaluation for introduction. Perhaps line breeding can slowly improve these further, but I have a few other thoughts about where cleaner and richer pinks might come from. The pinkest Siberian I ever remember seeing was Pink Haze growing in a far part of our garden in Indiana years ago. It was almost flamingo pink and seemed quite different from the usual color, so I checked the soil pH. For some reason it was 7.5, about the upper limit for Siberians to grow. Maybe that could explain the unusual color shift. So this brings us to the first thought. The color of anthocyanin pigments is quite complex and can be greatly altered by soil pH. Just think how the color of hydrangeas can be changed from pink to blue by adding aluminum salts to the soil. The pigment is the same but when it is complexed with aluminum, it changes from pink to blue. And, to make a hydrangea pinker, increasing soil pH helps, since this limits the uptake of aluminum. Could this be an explanation why Pink Haze looked so pink growing at an unusually high pH? I guess we’ll never know for certain, but certainly the soil pH can greatly affect flower color. Which raises another question - are pink Siberians pinker here in the Midwest (with generally neutral soils) than on the east or west coasts (often quite acid soils)? A study of the effect of soil pH on Siberian flower color would be an interesting thing to try. Just as external pH changes these colors, so does the pH inside the cell (which is not directly affected by soil pH). Also, different metals and the interaction with other co-pigment molecules can change color in a complex way that goes well beyond the bounds of this blog. Subtle change in cell pH (as small as 0.1 unit) can cause a surprisingly large change in the blue-pink color balance of flowers. Several tactics could work in theory to take advantage of this to give purer pinks - increased cell acidity, greater uptake of metals (aluminum) etc., but there is no obvious way to control these as a hybridizer, so you can only make promising crosses and hope for a lucky break in seedlings. Perhaps this is not just a pipe dream. There are quite clear pink Japanese irises with similar pigments to those in the Siberians. I’m hoping that we saw such a break this year with one seedling (10J4A5). This stood out quite strongly in a group of new seedlings as a stronger, clearer deep pink than the others. One year does not a breakthrough make, so we will need to see this bloom again to be sure it wasn’t just a weird aberration in what has been a very weird and nasty growing year, but that’s what makes hybridizing so addictive. The other means to brighter, pinker pinks is to play a subtle game of combining the current lavender pinks with a light yellow underlay. Too much yellow makes brownish shades that can be interesting but are not the objective. pink color than previous Siberians. Even more exciting is the thought that if you can get purer pinks with less blue influence through mechanism 1 and then combine this with yellow in mechanism 2, you could head towards true orange. Dreams, dreams.